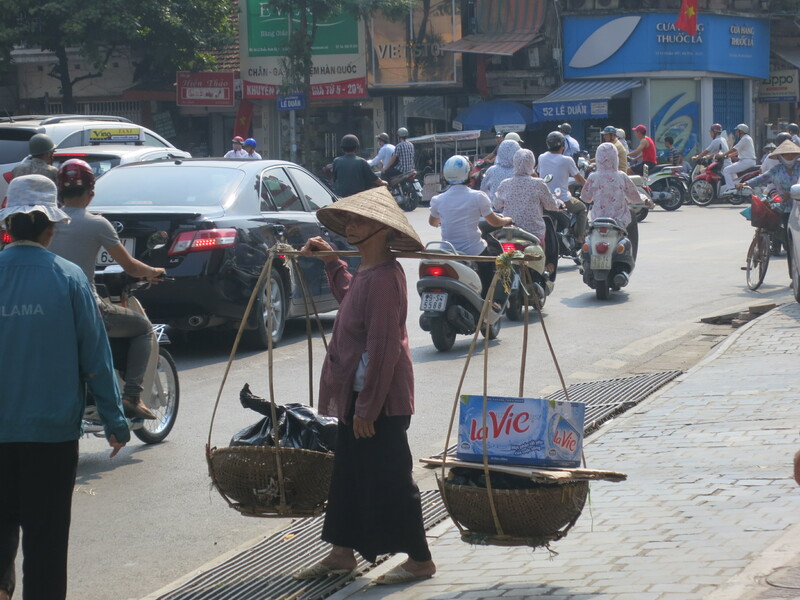 One of the things we are finding most wonderful about visiting Vietnam is how incredibly affordable everything is. Seriously, if you are looking to take an interesting and exciting vacation, this just may be the place to go. 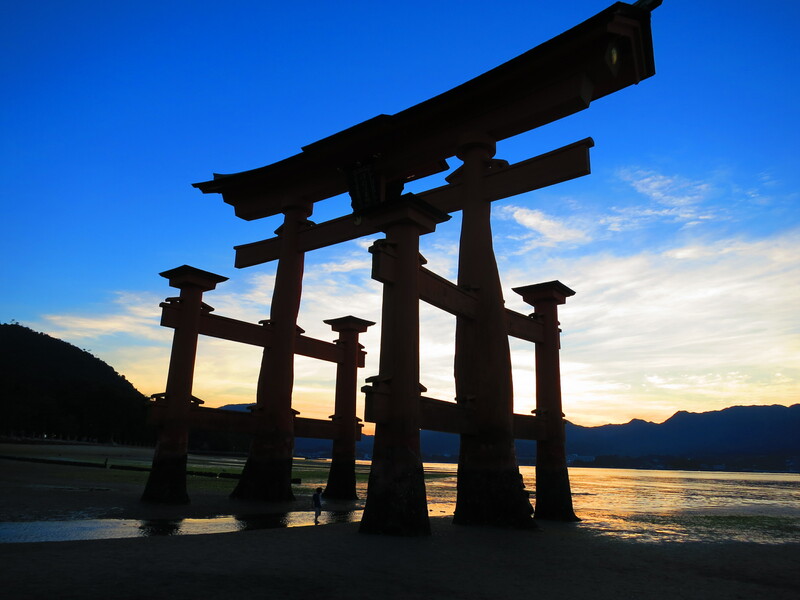 It has history, culture, shopping, beaches, and a whole lot to just observe and digest. 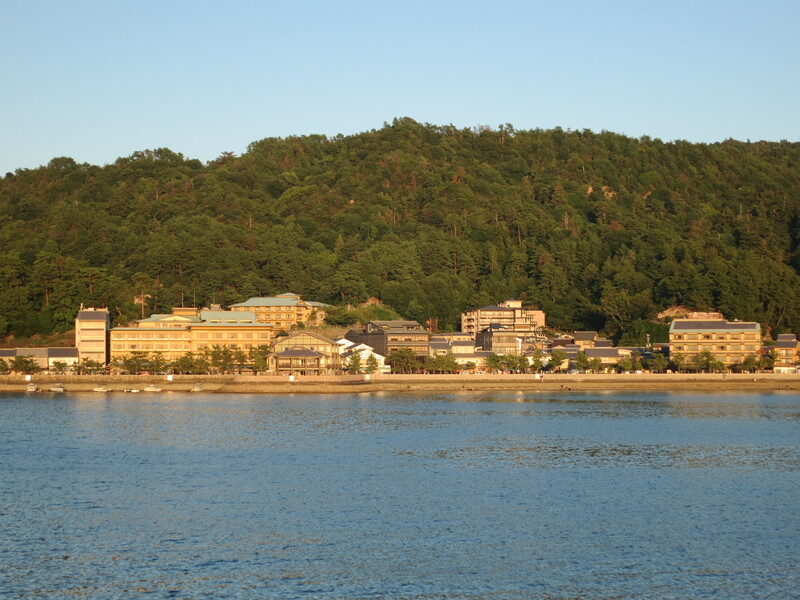 Because it is so affordable here, we are able to stay in a wonderful hotel for a reasonable price. The Hanoi Moment Hotel, a boutique hotel in the heart of Hanoi’s Old Quarter, prides itself on customer service. They arranged for our taxi from the airport so we wouldn’t get scammed and when we pulled up out front, the doorman ran to get our bags and carry them inside. 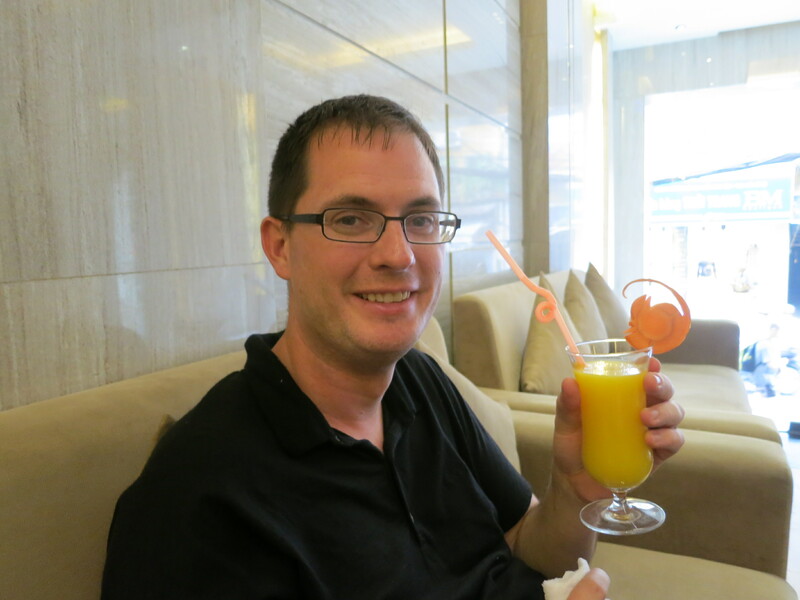 We were ushered in, presented with fresh mango juice and asked to sit on the couches while they checked us in. Soon, the very smiley and friendly Jimmy sat down with us to review the amenities of the hotel and room. When we looked up, our bags had already been taken to our room and Jimmy was escorting into the elevator and upstairs. As he opened the door, Jimmy informed us that he turned the air conditioning 30 minutes prior to our arrival so our room would be cool for us. A welcome tray of fruit sat on the bed and along with a complimentary bottle of wine. 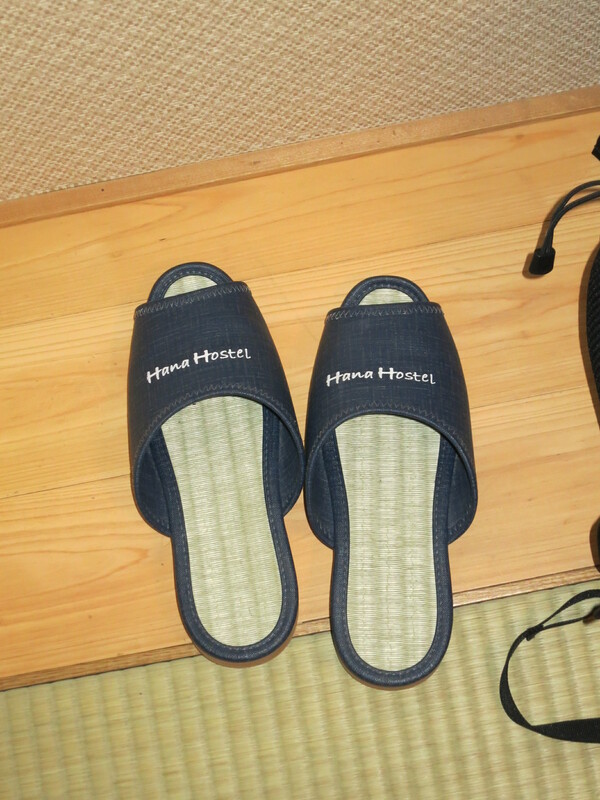 The room also has free water, robes, slippers and a WiFi connected laptop plugged in. It is really beautiful. These things helped Hanoi Moment Hotel to make a great first impression, however it is everything else that has really made us fall in love. There is a travel desk downstairs run by the very knowledgeable Ching. She is always eager to help and has been very patient with our many questions. She took care of booking a tour of Halong Bay which we will embark on tomorrow and also helped book tickets to a theater event. The best part is the awesome restaurant suggestions. They are really looking out for us. They even gave us a list of cab companies we could trust so we wouldn’t fall prey to the scams which are so common. We originally only booked two nights here, but we like it so much we are staying for a third. And the most amazing part is how affordable the hotel is. 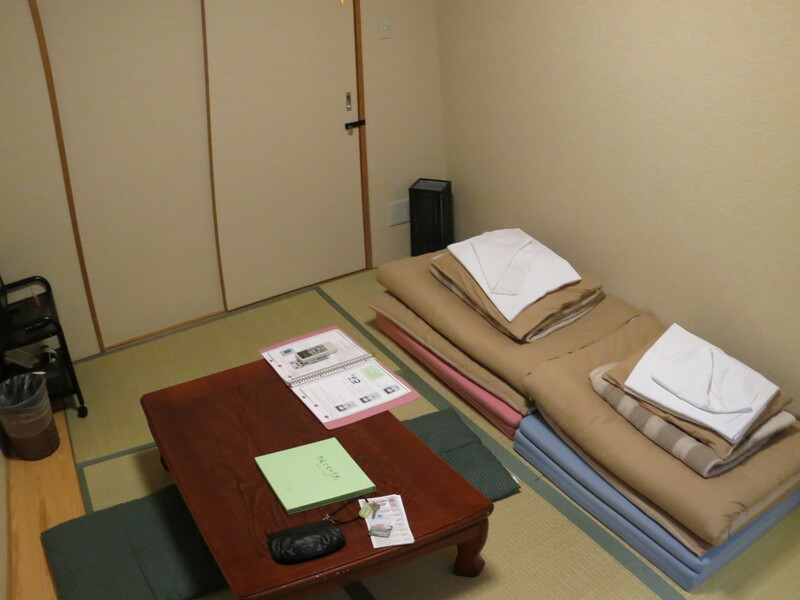 This wonderful stay is only costing $67 USD per night, including taxes. Amazing. It isn’t just the hotel that is affordable. We can’t believe how little things cost here. We first had to get used to doing the conversion from Vietnamese Dong to the US Dollar. Twenty-one thousand dong equals one dollar. Which means that 2,000,000 Dong equals $100. So, it is a little strange to buy two bottles of water and see the price ring up as 28,000. But, when we stop to think about it, we realize that is less than 2 bucks. That’s a great deal for two bottles of water! 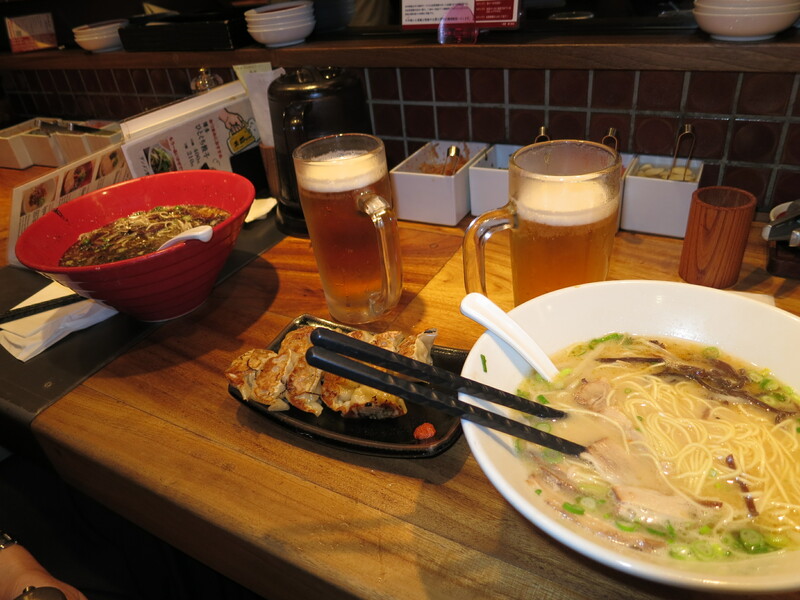 In addition, the local food we’ve eaten has not only been inexpensive (totaling about 15 bucks for a full dinner with two beers), but it has been delicious. The staff have guided us to outstanding places locals choose to eat and we look forward to trying more adventurous dishes. Aside from our interacting with the locals at restaurants and bars, we actually found ourselves engaging in some more typical tourist activities today. 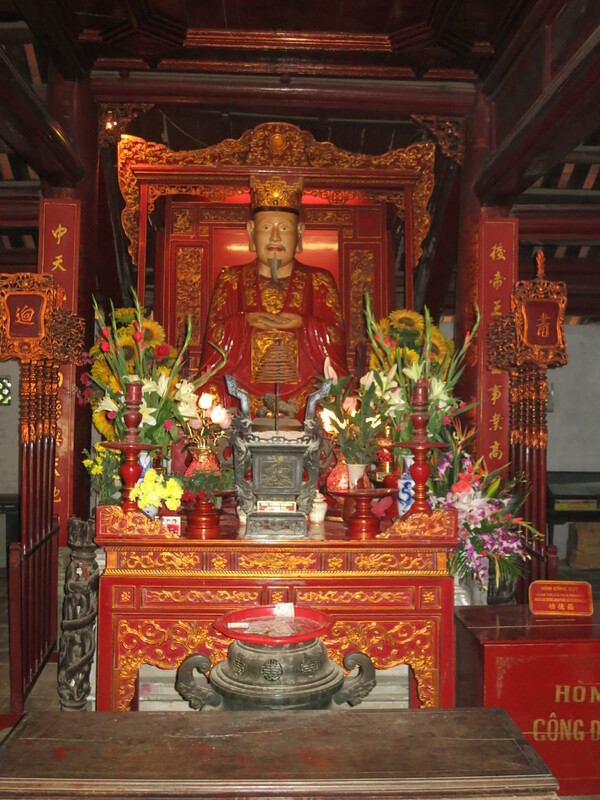 The first place we visited was the Temple of Literature, essentially an academic hall of fame for scholars of Confucius. 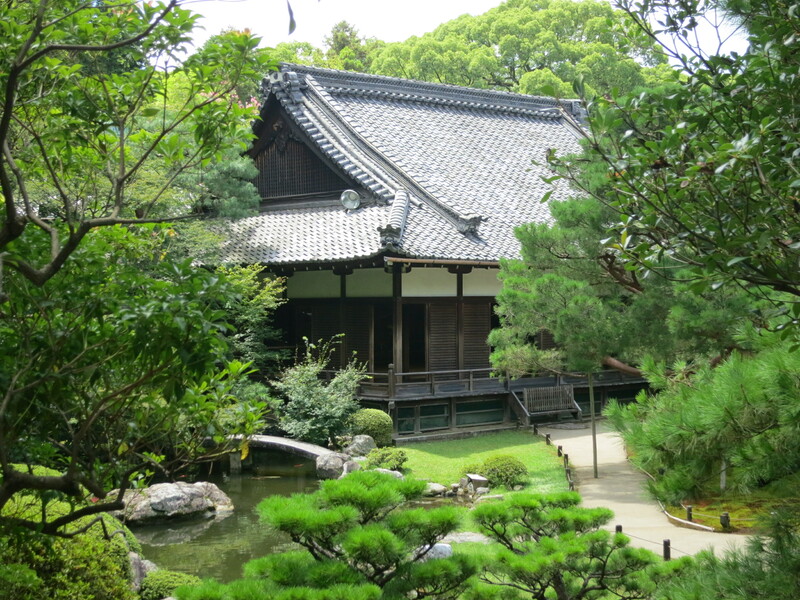 This complex looks like a temple, but is not dedicated to religious study. Instead, it honors the teachings of Confucius which are basically focused on how to become the best person you can be (really, how to be a gentleman but I’m trying to be PC). They have stone stelae with names of doctors who have passed the 82 Confucian exams and some of these date back to the 1400’s. I’m glad we visited, but overall it was a bit underwhelming. Perhaps a guide would have been helpful and we maybe could have appreciated it more. After the Temple of Literature, we went to the Vietnam Military History Museum. This was easily the most interesting and unsettling thing we saw today. Of course, we all know the history the US has with Vietnam and I was really interested to visit this museum to see a new perspective. I didn’t anticipate how upsetting it would be. Outside the museum they have aircraft which have been captured from the French and the US, and in the center of all of these is a huge sculpture formed from wreckage of downed aircraft. 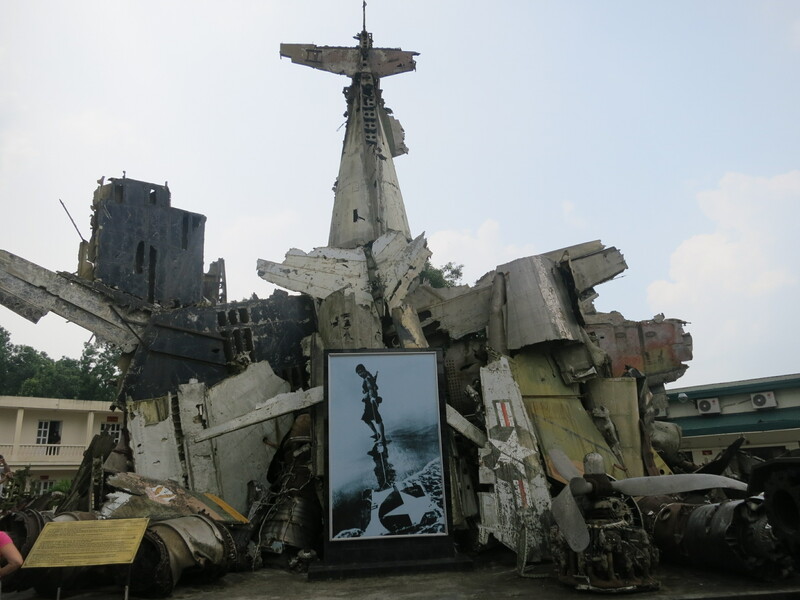 Looking at this gigantic pile of crumpled metal which had been shot down, thinking about the pilots of these aircraft and reading the plaques which brag about how many planes were brought down made me feel kind of sick. Throughout the whole museum we got a sense of boasting about winning battles, downing aircraft and defeating the enemy. In one exhibit, they even had the uniform of Lt. Everett Alvarez on display. He was the first American pilot prisoner of war and one of the longest POWs in American history, having been held for over 8 years. Seeing his uniform on display like a trophy was surreal. I’m not sure if I’m describing this right, but the whole museum focused on triumph and victory, nothing about any casualties suffered by the Vietnamese. They call the Fall of Saigon the Liberation. They called the Saigon Government the Puppet Government. The whole thing was so one-sided and filled with propaganda. Of course, it constantly reminded me of Animal Farm by George Orwell, a book I love and know well from having taught it for 6 years. 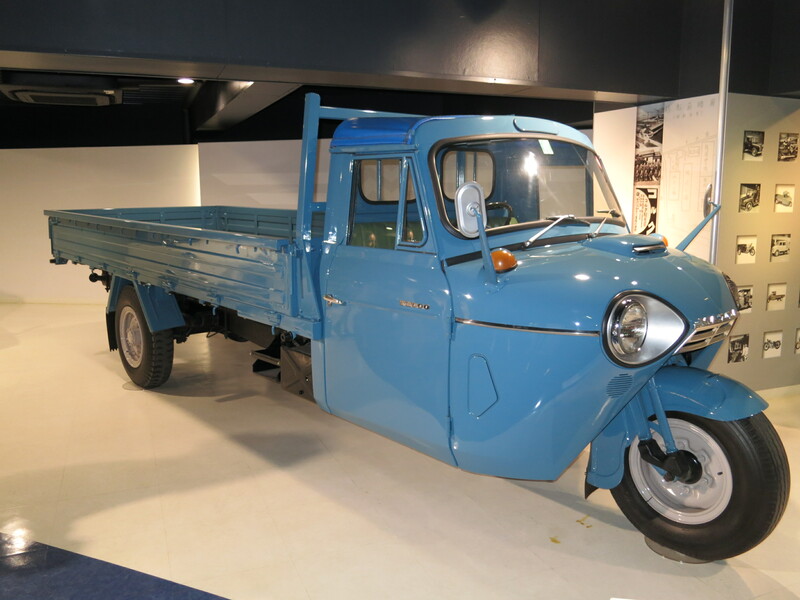 It may sound strange, but we could really feel the Communism in this museum. 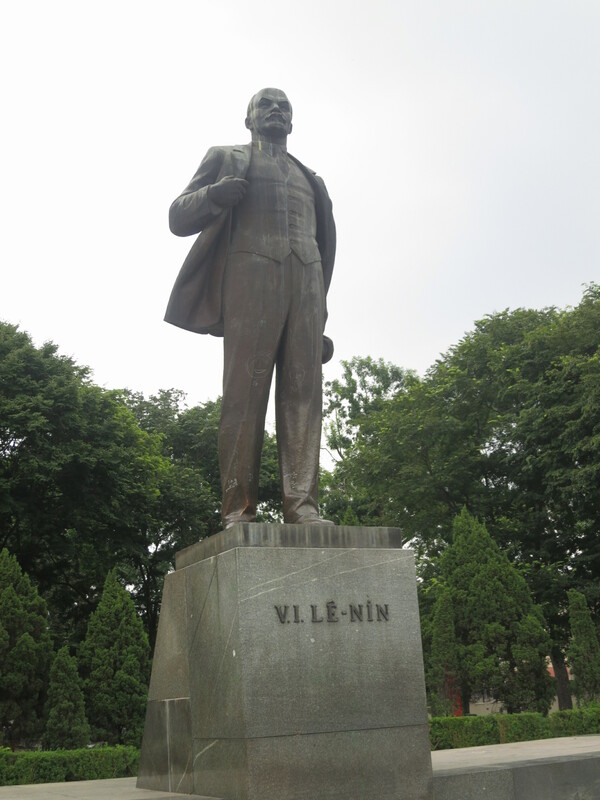 Perhaps it was the giant statue of Vladimir Lenin across the street. The whole thing was really interesting. Phil and I wondered, are American war museums like this? I realize the closest I’ve come to one is the Air Force Museum at Wright Patterson Air Force Base, but I remember that as being more a display of artifacts, not celebrations of killing. 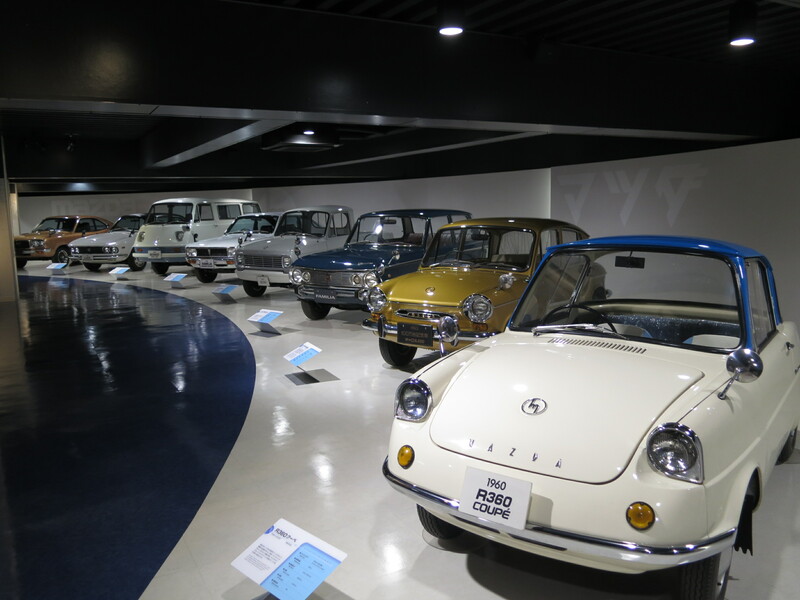 I can imagine how visiting this museum could be very difficult, especially for members of my parents’ generation. 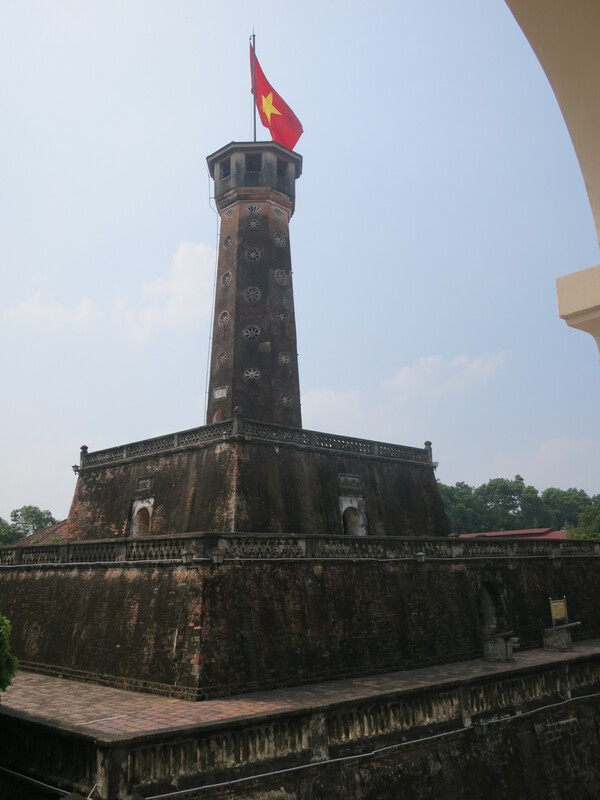 I’m glad we went, but our response to the exhibits has made us reconsider if we should to go the Hanoi Hilton Museum, the infamous jail where US prisoners of war were held, most notably John McCain. Our visit to the museum today and our response to those exhibits illustrate for me the reasons why it is important to travel. Seeing other perspectives, analyzing how information is presented and considering if that is reflected in one’s own culture broadens your horizons and makes you think about things in new ways. 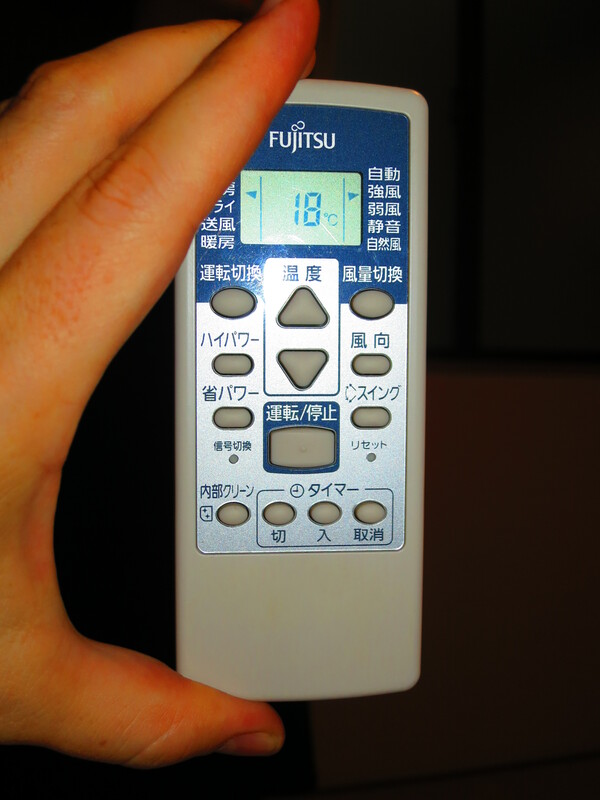 I think that is one of the most valuable things that will come out of this trip. 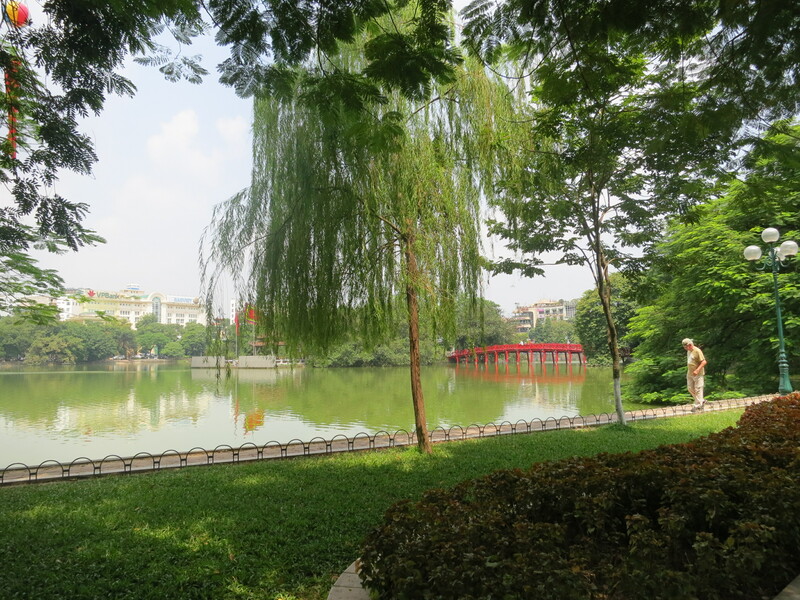 We can’t wait to continue our journey and explore more of Vietnam. 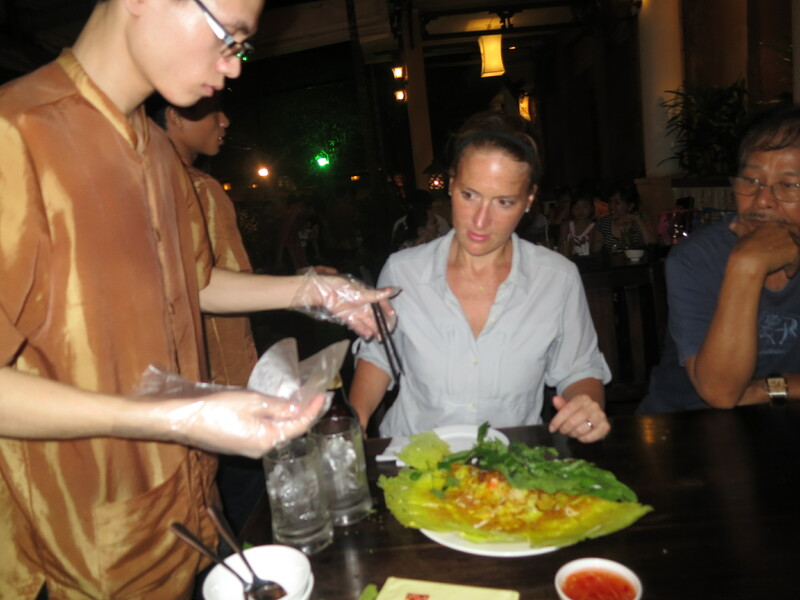 The waiter had to show Brooke how to eat her Vietnamese pancake with shrimp and bean sprouts. Wrap it in rice paper and dip it in delicious sauce. Yum! If you had asked me back in June what was a “must do” on our trip, I would have said hitting up some international sporting events. Cricket, Rugby or even Sumo Wrestling. Want to see some sports live and in action. 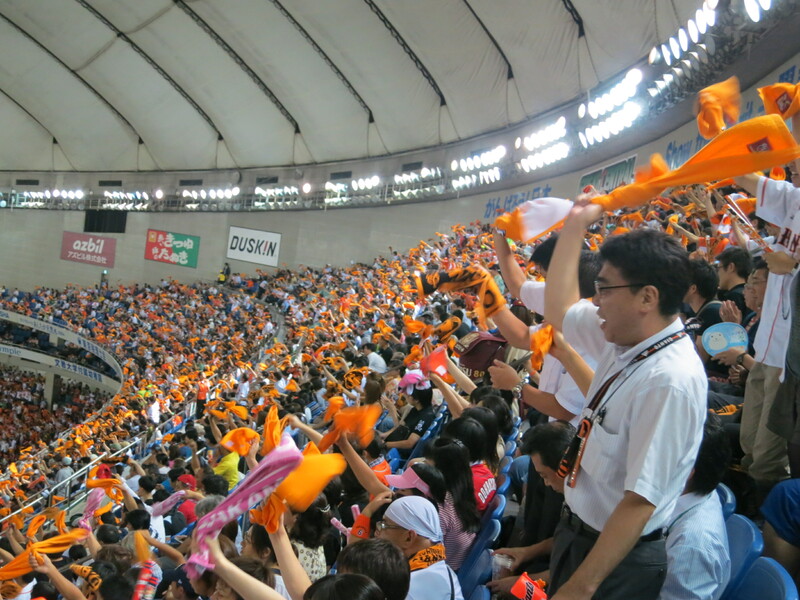 Yesterday, our evening in Tokyo brought us the highlight of the day and one of my favorite moments of the trip so far – attending a Yomiuri Giants baseball game at the Tokyo Dome! Holy crap on a stick, this was cool! 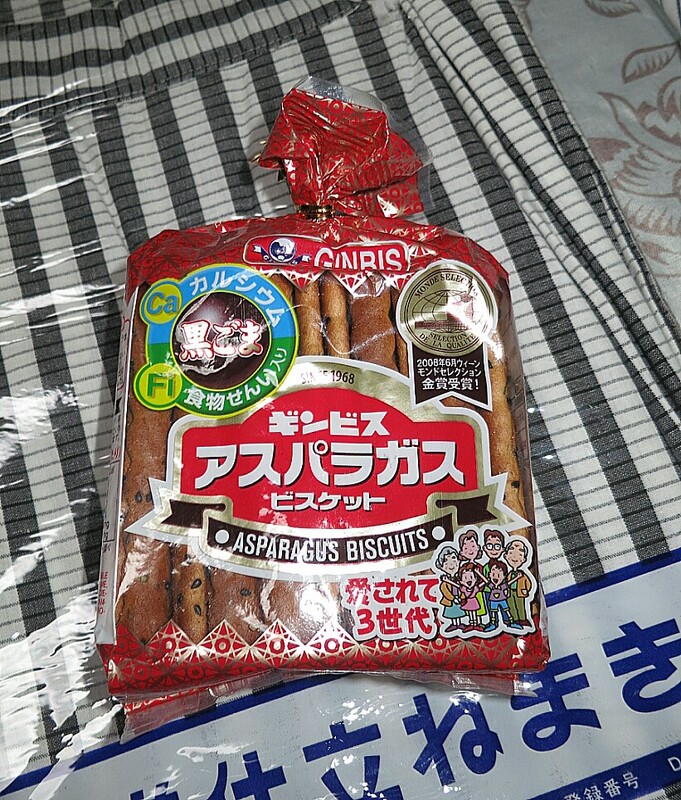 It was baseball…in Japan. 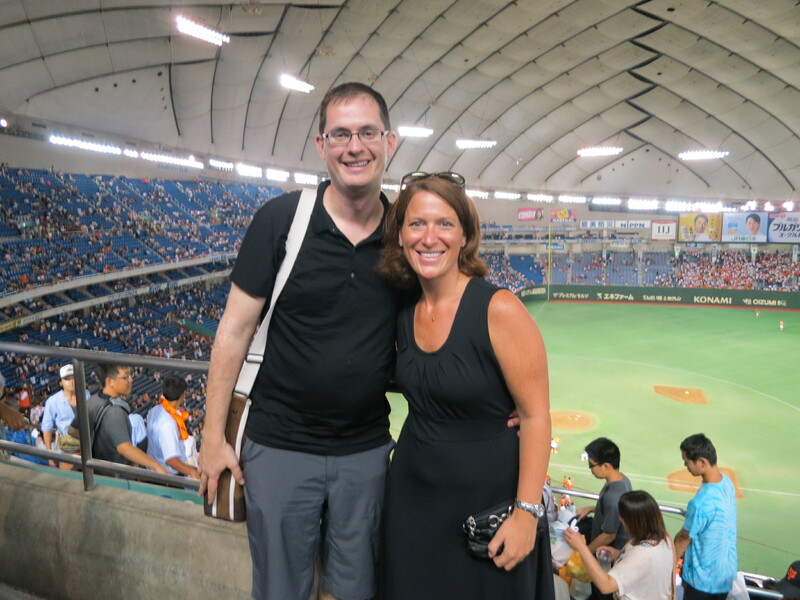 Brooke and I had an amazing time watching the game against The Hiroshima Carp (one of only 12 other teams in the league.) Wow, what an experience. Our seats were relatively high up, but the entire space was relatively small for a dome so we could see it all. The Giants wear the exact same colors of the San Francisco Giants and the team had six mascots running around the field. Six of them! Also of note were that ALL of the beer vendors were women. There were working hard: hustling up and down the aisles with min-kegs strapped to their back and big smiles and colorful outfits. 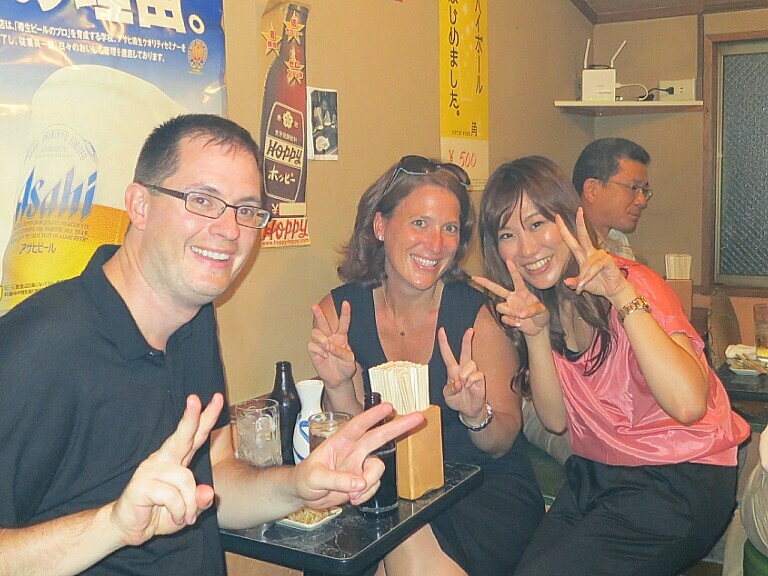 And, yeah, the beers may still cost $10, but at least it was a high quality Asahi brew served by a very cute girl! But the most eye-popping part of the baseball game was the crowd. Through every inning, a small brass band and loud drum led the entire stadium in a wide variety of cheers, songs and chants. Hard to do it justice in this post, but the enthusiasm and energy was infectious and constant. Every batter had his own song and when a homerun was hit – look out – the roof almost came off the place. I’ve never seen anything like it! It was like a college football game with a drum corps and even a vocal (but polite) visitors section. Remarkable. I love baseball in the states, always have, and now I think I love baseball in Japan. The game play was exactly the same as in America and it was a high-quality competitive match up. As good as any MLB game (and there were some American players on each team). No 7th inning stretch, but there was plenty of singing. We never could find the bullpen- believe it to be behind the stands. 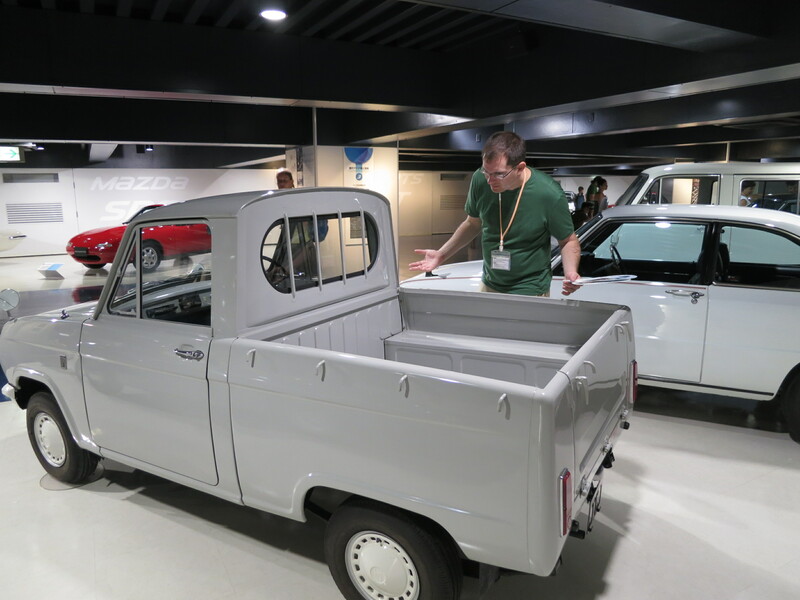 And, sure, the Tokyo Dome is a little bit on the older side, but who cares? With a nearly sold out crowd and those never-ending chants, the good guys won 5-0. To celebrate the win, the home team lined up and bowed to the fans! We never knew what was going to happen next. 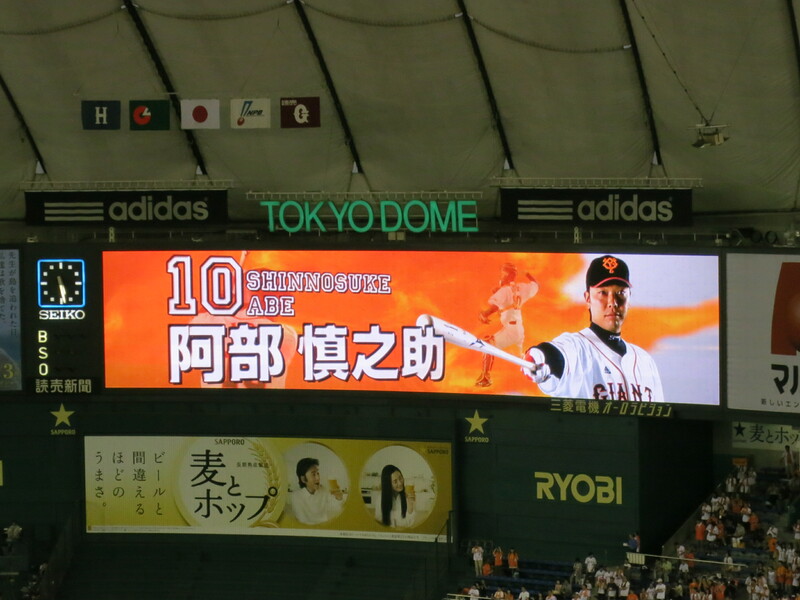 After the game, player #25 Takahashi was honored for hitting his 300th home run. At least we think that’s what was going on…baseball may be an international language, but the signs and announcements were still in Japanese. After a small ceremony, he rode on the back of a golf-cart and threw out several autographed baseballs to eager fans waiting in the outfield stands! The game is so fan friendly that it’s dizzying. A night out at the ballpark was anything but ordinary and an absurd amount of fun. Go Giants! 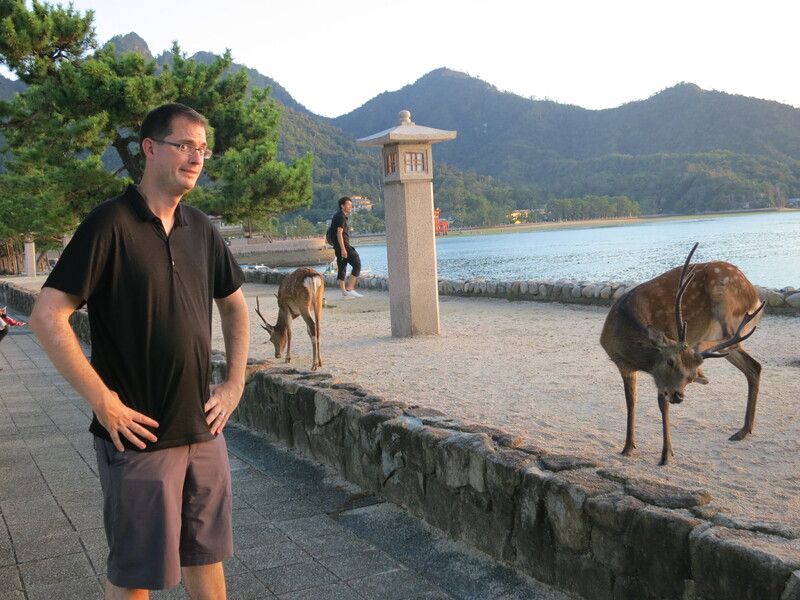 I begin this update from Japan by asking for your forgiveness in advance. This is going to be a long blog post. There is just no way around it. 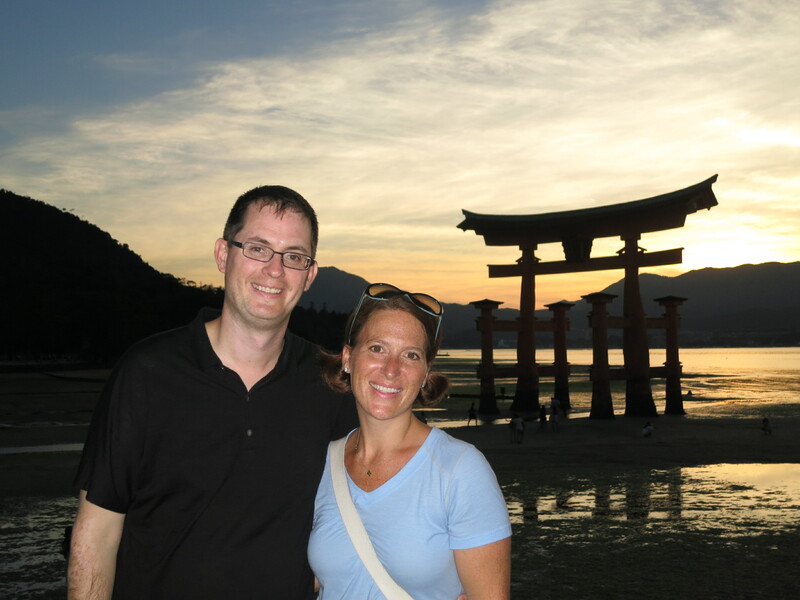 Our second full day in Japan was so full and amazing, that we have a lot to share. 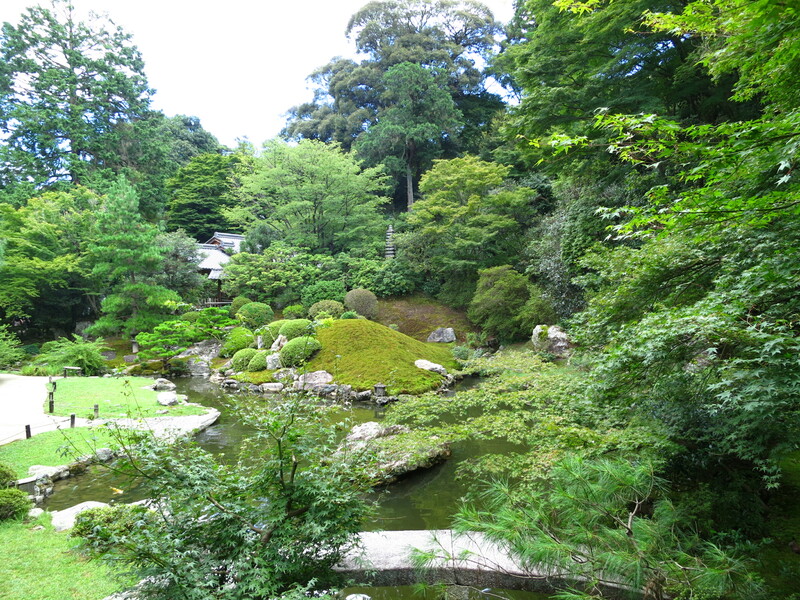 Today was our designated Tokyo day and the entire day was spent exploring just a bit of this mammoth, expansive city. 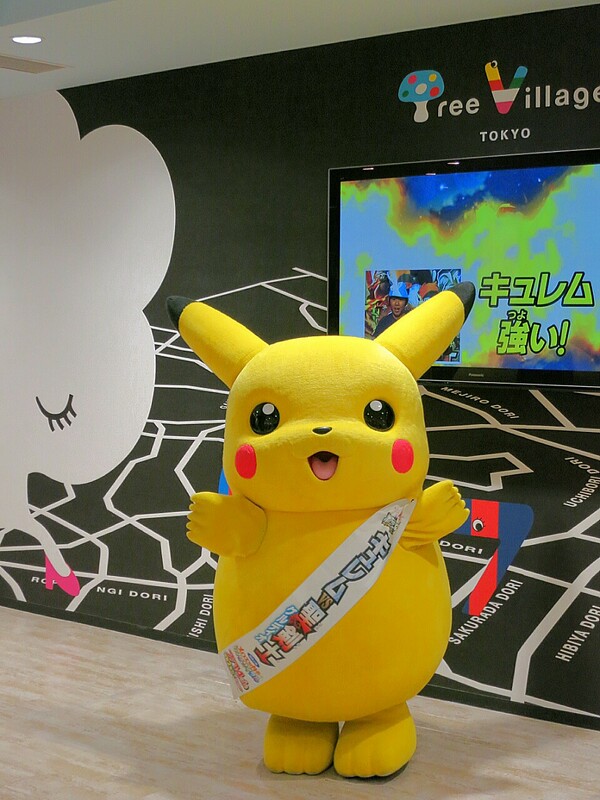 Even had an encounter with a giant Pikachu. 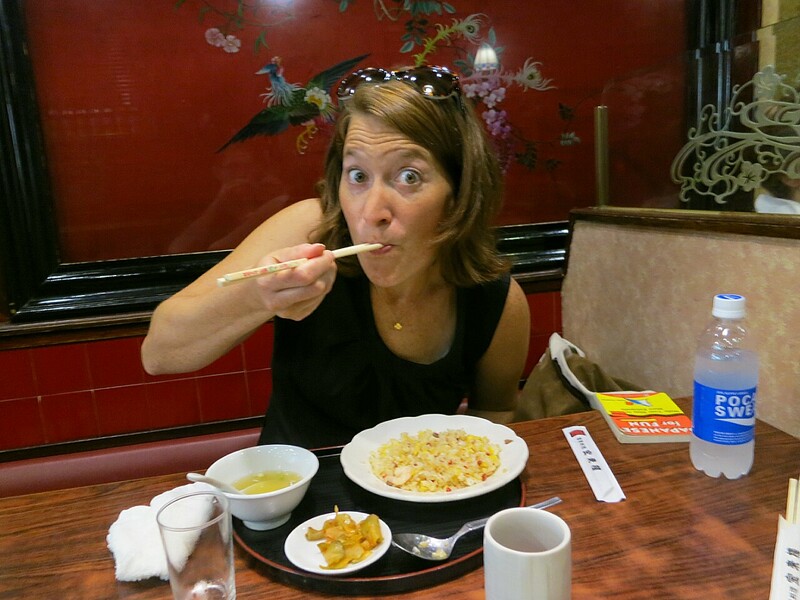 We spent the better part of 13 hours absorbing Japanese culture from district to district. 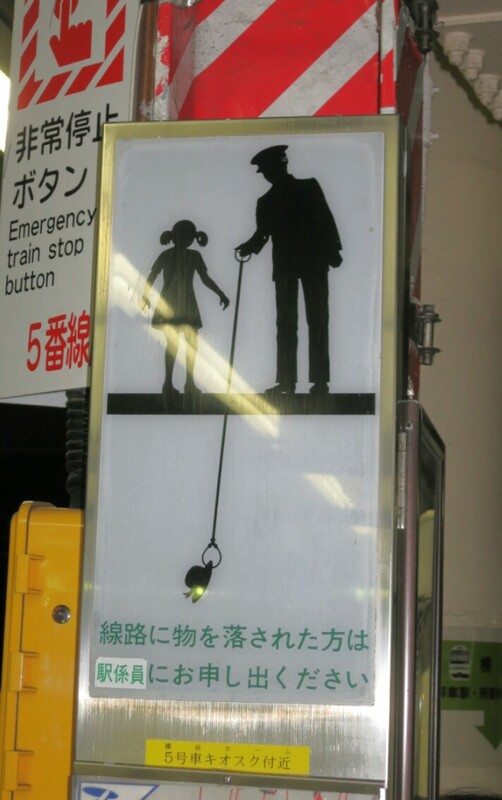 Lucky for us, you can’t really go wrong in Tokyo. 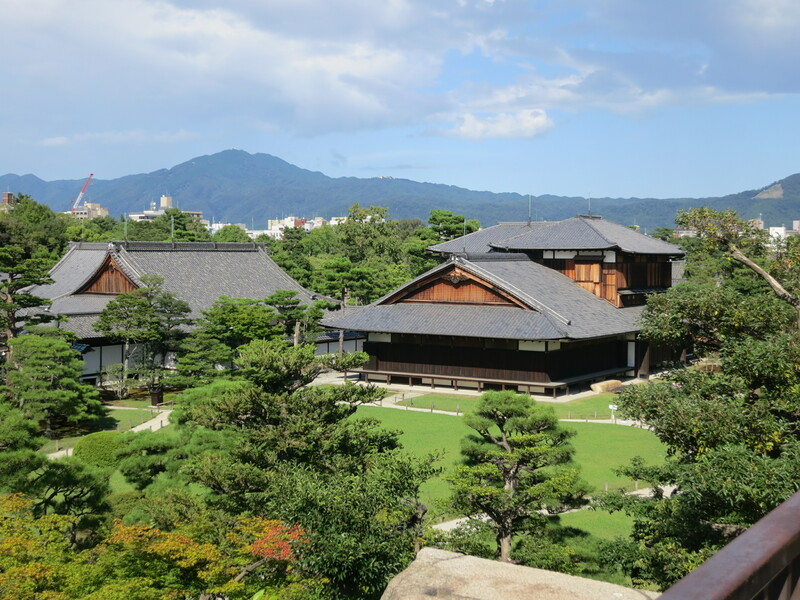 With a town this gigantic, just about every neighborhood offers something capitivating, interesting and worth mentioning in a ridiculously long blog post. 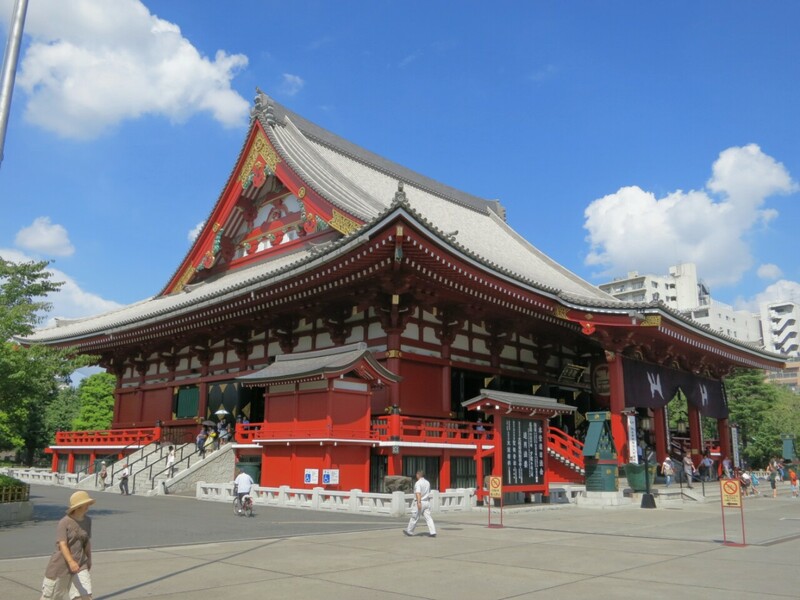 We started our day in the well-visited district of Asakusa which is likely best known for it’s Senso-Ji temple complex and hundreds of tiny, cute shops in Nakamise-Dori. 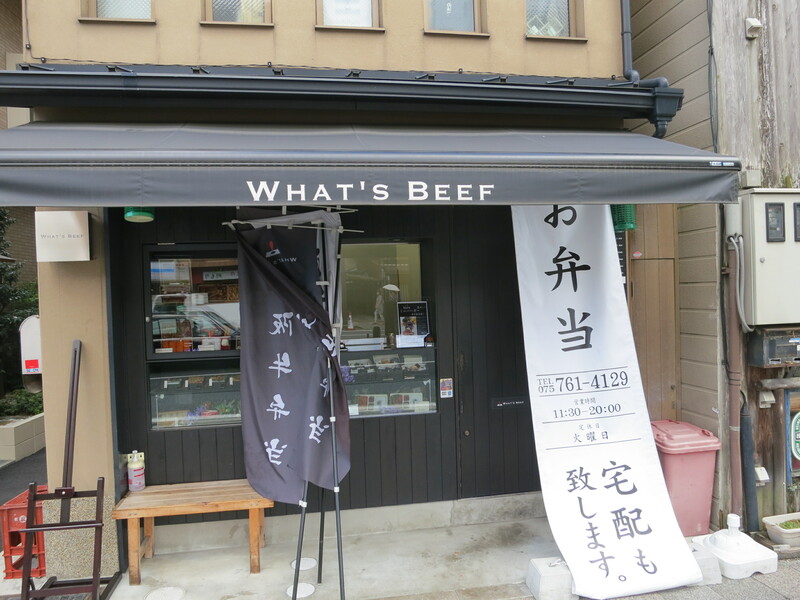 Once off the train, we grabbed lunch at a beckoning seemingly-Japanese restaraunt. The language barrier struck again because I’m pretty sure that we might have actually eaten at a Chinese restaurant. The jury is still out. We had pangs of regrets later on because we passed dozens of food booths that we’re hawking delicious smelling, exotic street meat. 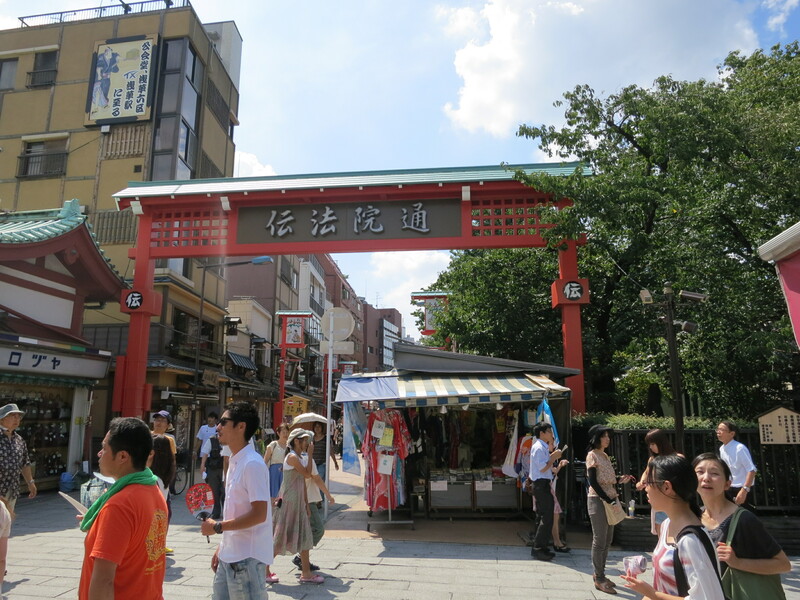 We strolled from shop to shop, investigating endless keepsake and souvenier options (we’re overdue for some new chopsticks and Brooke thinks I would look good in a Kimono) and enjoyed the sites despite the scorching sun. We even saw some interesting plaques that gave us some handy pointers on how to Ninja Proof our new home in Louisville. 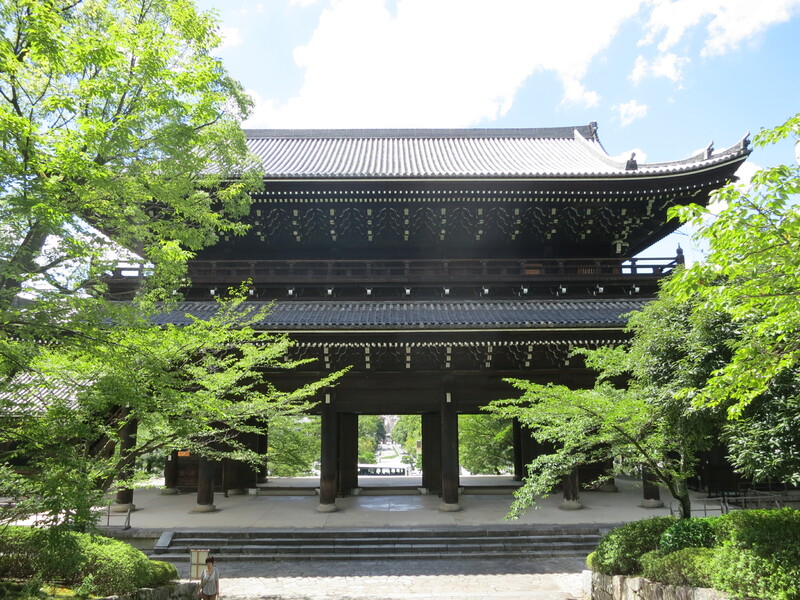 We finally happened across the giant, bustling temple complex. 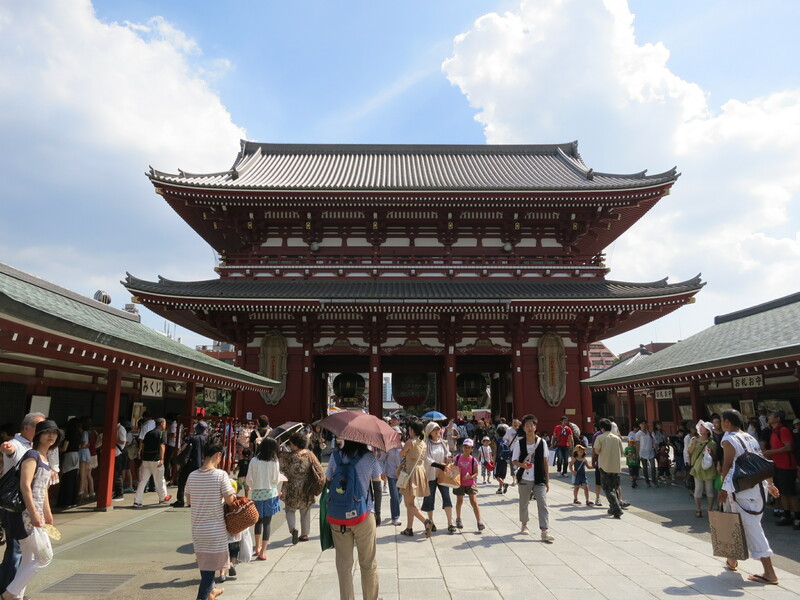 Although rebuilt in the 1960’s, Senso-Ji had an impressive collection of gates, temples and pagodas. 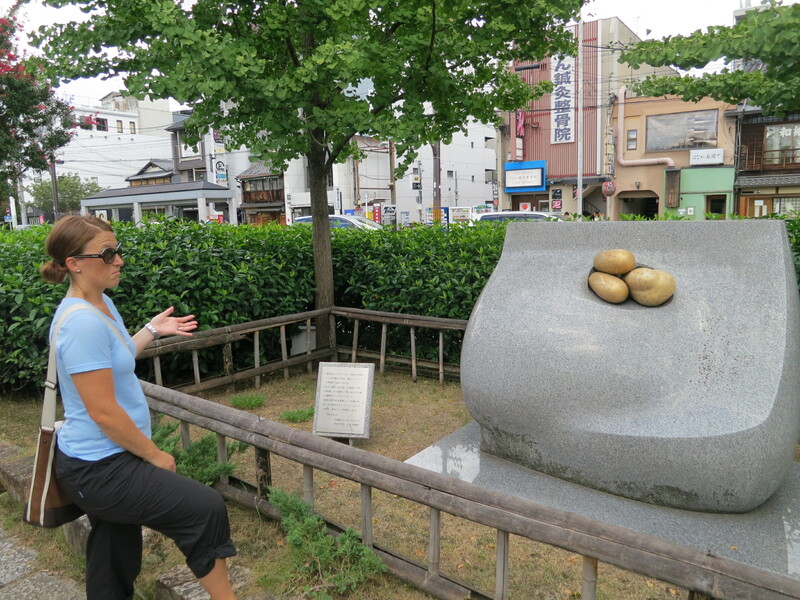 We even took part in some rituals when we threw 100 yen in the well, said a prayer, and received a fortune based on the Japanese character for luck. There were also rituals involving burning incense and washing with temple water that were popular among the visitors. 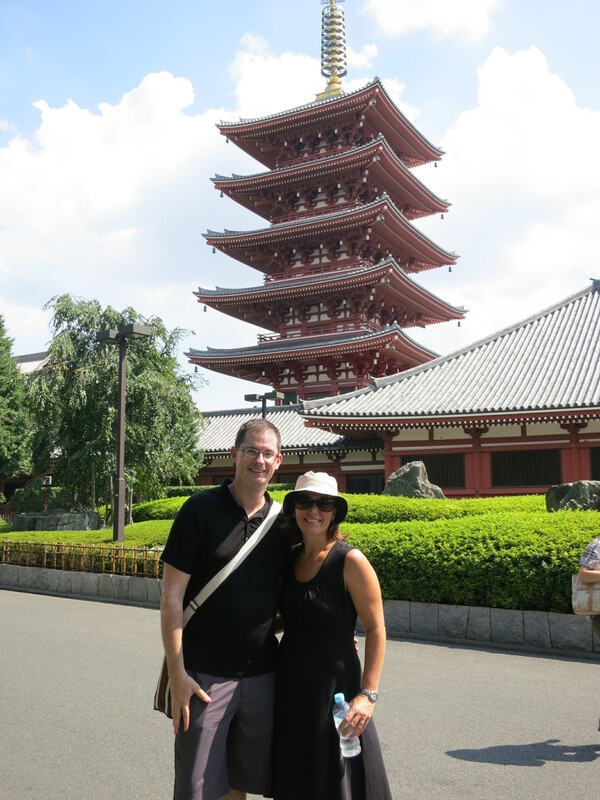 The temple complex, complete with giant lantern that could replace Lady Liberty’s torch, was a great visit. 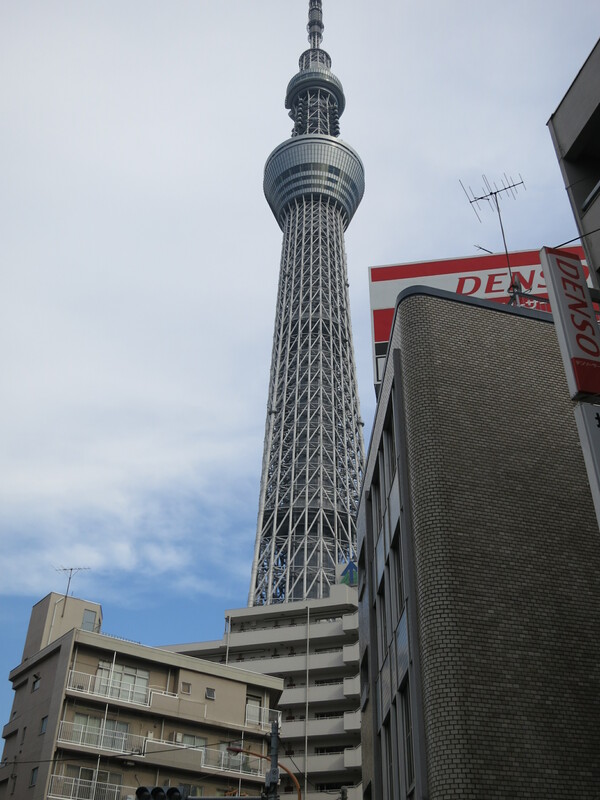 From Asakusa, we set our sites on the newly-completed Sky Tree Town tower. Opened this past spring, Sky Tree is…well…a giant tower. Impressively tall, notably modern and complete with an entertainment complex that includes an aquarium, planetarium and crazy toy store that looks like a Tim Burton dream (this is where I saw Pikachu). The tower was packed with excited, massive crowds to fill every space. The cost to get to the top of to the tower was enough alone to dissuade us, but if that didn’t do it, the ridiculously long line would have. 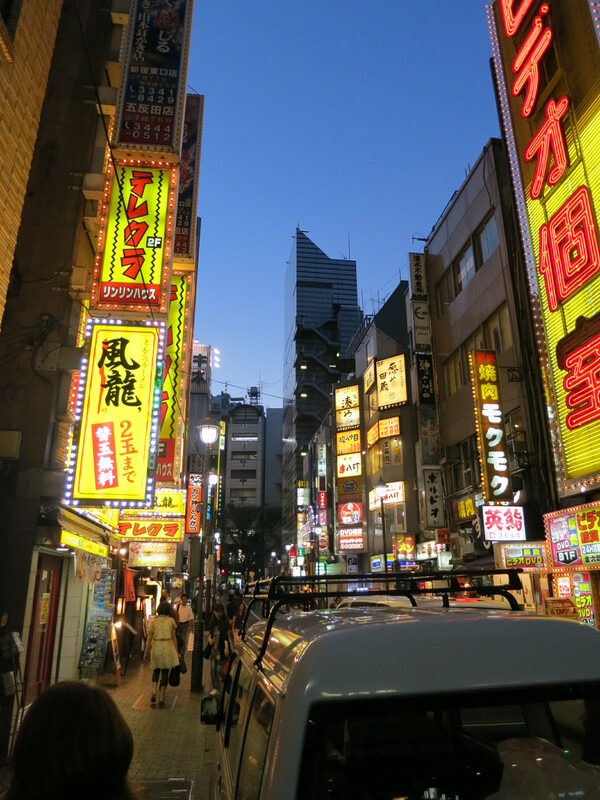 Our last stop of the night, was in the neighborhood of Shinjuku – with 3 million commuters going through here each day, it is home of one of the city’s largest train stations. 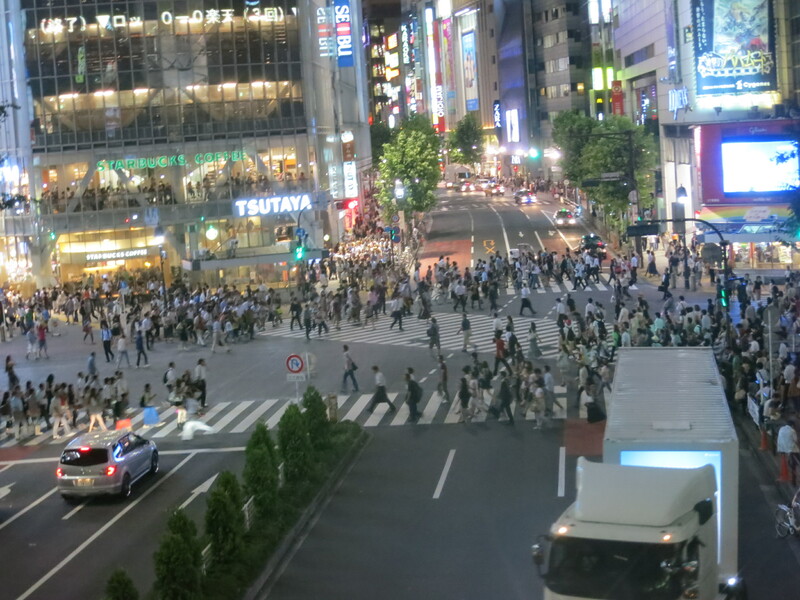 The hustle and bustle of Shinjuku at 10:30 PM on a Friday night makes Grand Central Station look like a backwater bus stop. Once again, we learned that just taking that extra step around the corner will take you all kinds of places. 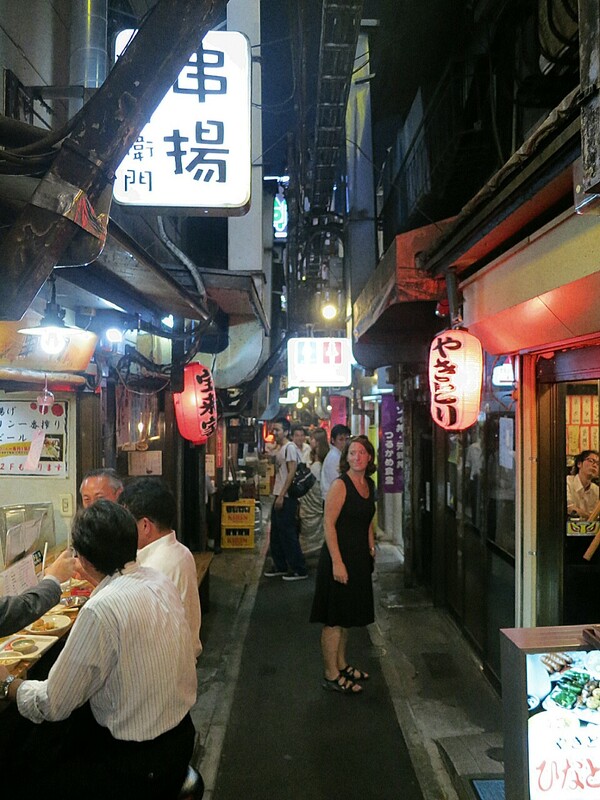 We looked down a narrow and appealing alley and ended up in what they call a Yakitori style restaurant. We learned later that the alley has been called both “Memory Lane” and “Piss Alley” – which should tell you something right there. After being beckoned into a itty-bitty restaurant smack-dab against a dozen clones, we were ushered upstairs to an even smaller dining area that barely held eight people. This was a dinner like no other made up of kebabs and long sitting crowds. You know you’re having an authentic experience when the other guests are so fascinated by your presence that they ask to take pictures of YOU! The various chicken kebabs we’re tasty and “oyshikata.” When we ordered beer, we received a “White Hoppy” and “Black Hoppy” in a bottle. The waitress, in broken English, suggested we mix it with at least 1 to 2 parts water that she had brought to the table. I loaded my glass with this water, poured in the beer and sampled. 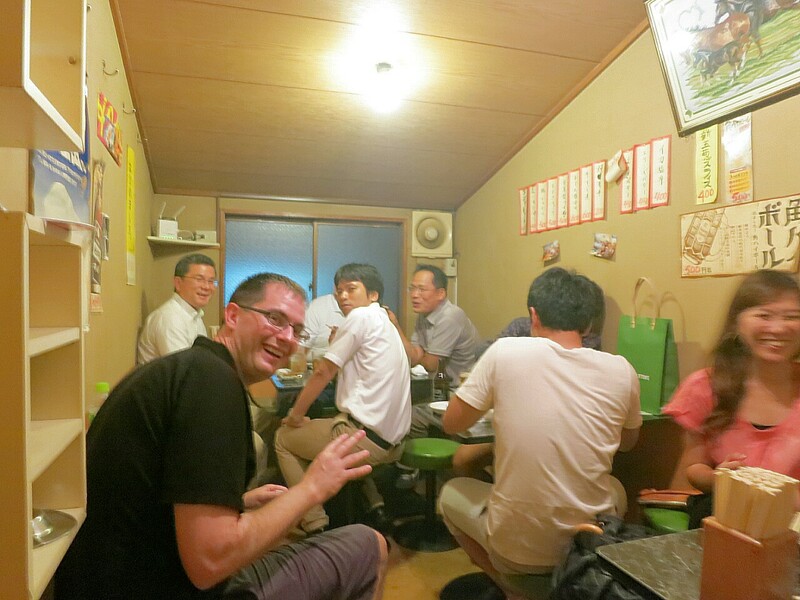 Hilarity (and a touch of drunkenness) ensued when it turns out that the water….was Sake. Let’s just say it was a much stronger “beer” than I was expecting. 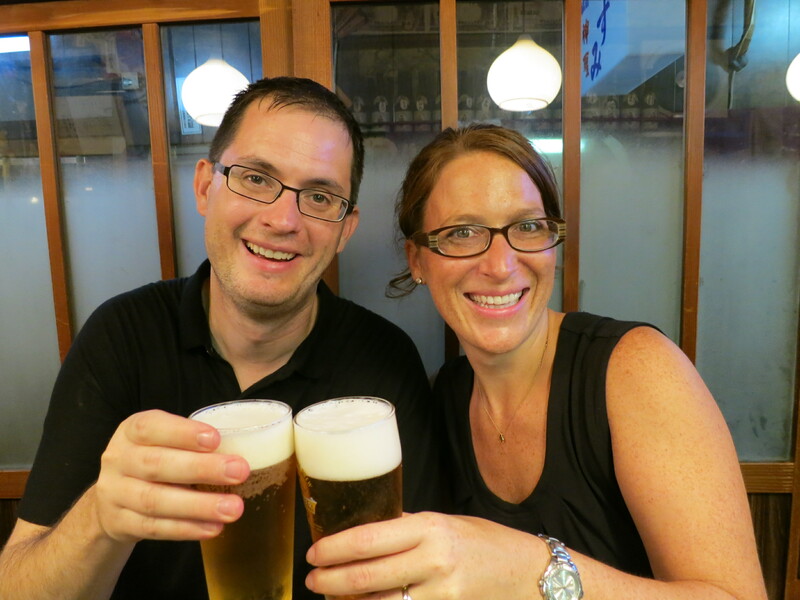 On the long train ride home in the middle of a beautiful summer night, Brooke and I reflected that the Yakitori were shady enough to be fun, but not shady enough to make you nervous. Today was the epitome of what we want out of our Round The World trip. Sensational new discoveries and unexpected cultural experiences. Just a great day! 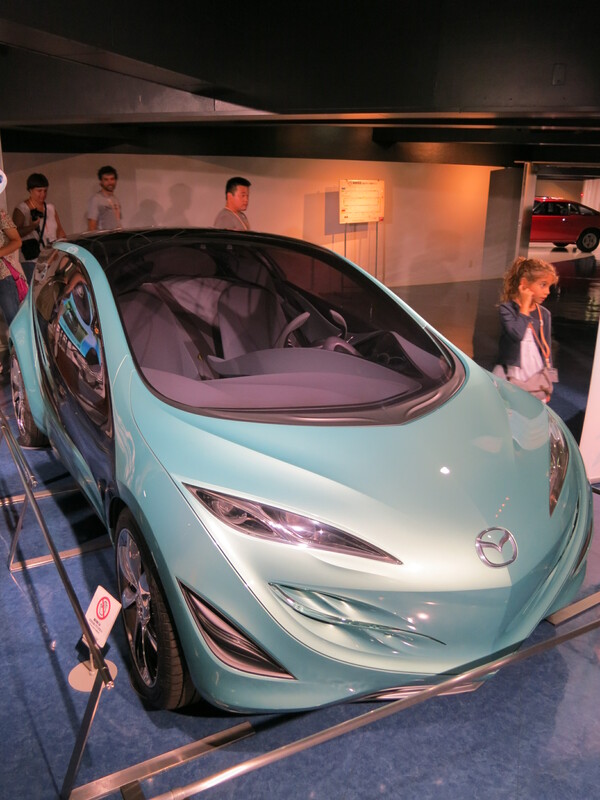 And it is only our second day in Japan! We’re finding our way around with greater ease by the hour. The endless amount of well marked signs is a big help. Although it’s an interesting puzzle trying to find a pattern of why some signs are in English and why some have zero English. As a bonus, we’ve even able to master a few handy phrases. 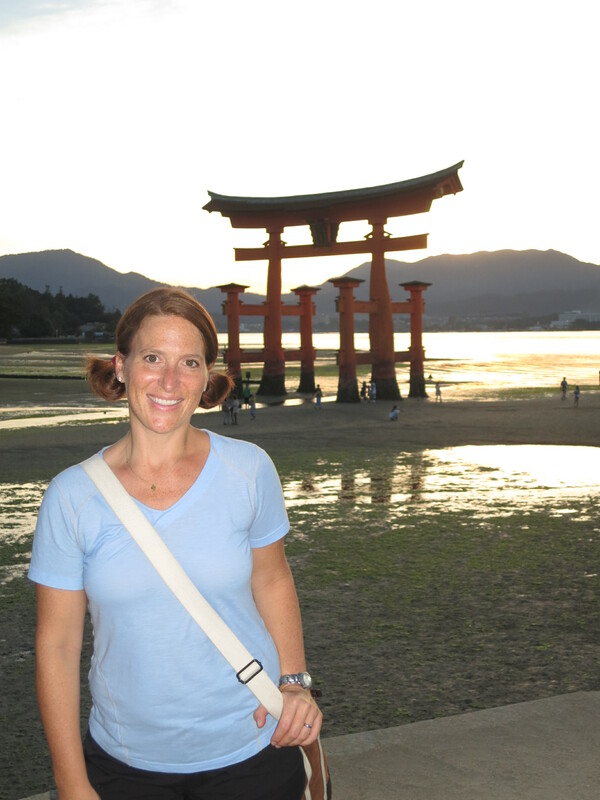 As we shut down for the evening, I asked Brooke, “What will see tomorrow?” Her answer: “Everything!” Tomorrow: Kyoto! Holy crap, it’s a life size, hugable pokemon. Pika Pika!